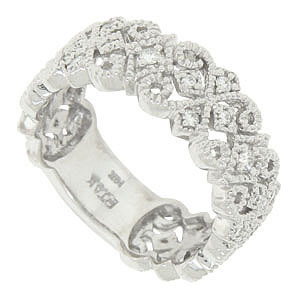 An elegant pattern of curling x-shaped vines and diamonds circle the face of this 14K white gold wedding band. 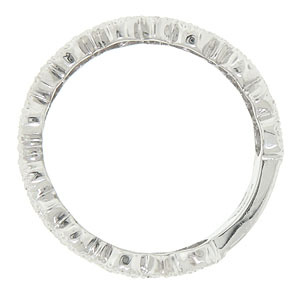 The organic floral wedding ring is frosted with round diamonds and edged in a delicate milgrain decoration. The ring is set with .24 carat total weight of round diamonds and measures 7.40 mm in width. Size 6 3/4. We can re-size or reorder in any size. Available in 18K, yellow gold and platinum.